Manchester’s Centre for Development Informatics is looking for a partner organisation to help pilot a new tool that will assess the impact of ICT projects on the climate change resilience of low-income communities. Resilience is increasingly understood to be an essential capacity of communities if they are to survive and thrive amid the environmental and other shocks likely to arise during the 21st century. It provides a holistic, long-term and community-centred approach that is rising up the development agenda. But we have so far lacked robust tools for baseline measurements of resilience, or for assessment of the impact on resilience of interventions such as ICT projects. 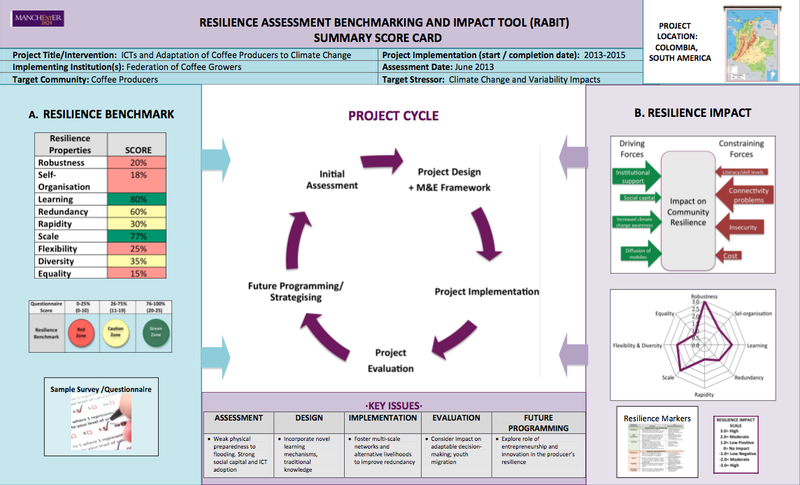 Developed from a combination of systems thinking and fieldwork in the global South, RABIT – the Resilience Assessment Benchmarking and Impact Tool (see sample scorecard below) – is now ready to move to full field testing. This will likely involve some training/capacity-building plus use of the tool to assess and then guide an ICT project, towards the end of 2013/start of 2014. Only seedcorn funding has been provided by the University of Manchester, so we are particularly interested to hear from organisations with an ongoing commitment to resilience-building and an ability to scale results. If successful, the pilot could form the basis for a longer-term bid for action research funding. You are of course welcome to contact us with any questions. If you are not in a position to partner on pilot testing but are still interested in results from the project, do let us know. NICCD is the Nexus for ICTs, Climate Change and Development project, funded by Canada’s IDRC and managed by the Centre for Development Informatics at the University of Manchester. CDI is the largest academic grouping researching ICTs and socio-economic development. It is a joint venture between the University’s School of Environment, Education and Development, and the Manchester Business School.